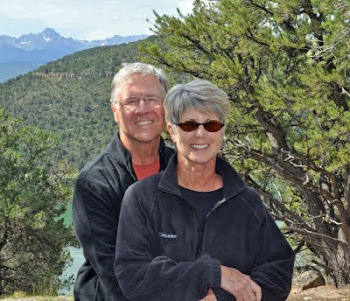 Find us on Google+ Rick and JoAnne's RV Travels: Zion…What does that mean? What does word Zion actually mean? What I found is Zion has two possible literal meanings. Some believe it comes from a Hebrew root meaning "barren place" or "desert". Others point equally to an ancient Semitic word that means "fortified" or "protected". From what we see, it sure lives up to those descriptions. 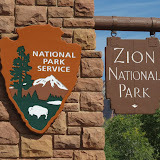 Zion National Park, in Springdale, Utah was Utah’s first of the current five National Parks in Utah. It’s beautiful and extremely popular with its’ 3, 666 to 8, 726 foot vertical peaks, rose colored cliffs and deep canyons. We knew this was going to be a stop for us on our way to Desert Hot Springs, California. We have been here many, many times before, even camping here with some friends, but this time we decided to camp by ourselves in the first come, first serve South Campground. The unique thing about Zion, for us this time, was about exploring the area more thoroughly, learning, and experiencing things we never knew about Zion – and that’s just what we did. Rick took a long bike ride (make sure to see those photos) and we both took the wonderful shuttle to the top and back. The nice thing about the shuttle system is it’s free; you can get off and get on at various stops throughout the park, and cars are not allowed in many places. After leaving here we were on our way to California… we truly enjoyed our time “roughing it”, exploring, resting, photographing the sites, along with people and animal watching. This was a great time to be in Zion, beautiful as always and this time there was some fall color. Best of all... it was cooler - temps in the 80's vs. the 100's in past trips.